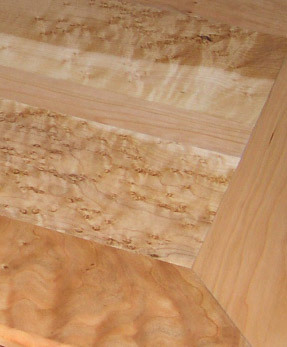 This is a detail picture of the top of the display chest I am building now. I used two types of wood in the construction. The outer border and center stripe are cherry; the two panels are bird's eye maple. When completed, the chest will act as a window seat for the cats and a storage area for their toys. I will put it in the living room next to the entertainment unit. You can follow the links to the left to see more about my projects.